Brynne Palmer- How long have you been tattooing? Tim Hendricks- My mom said I started messing around with it around 15 or 16. I’m 36 now, so about 20 years, give or take. 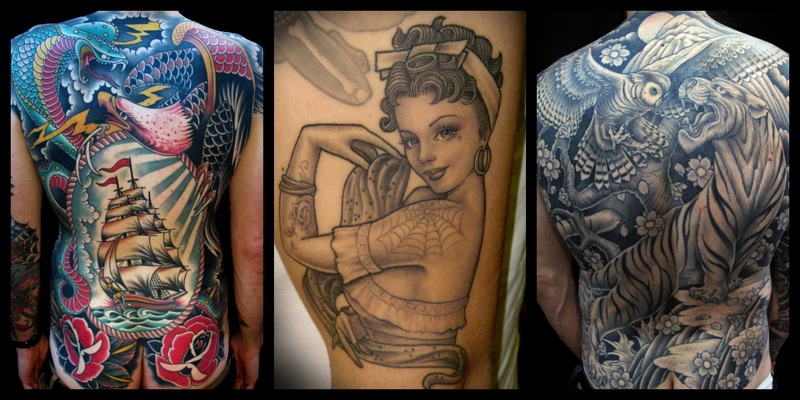 BP- Do you have any chef clients, and what have you tattooed on them? 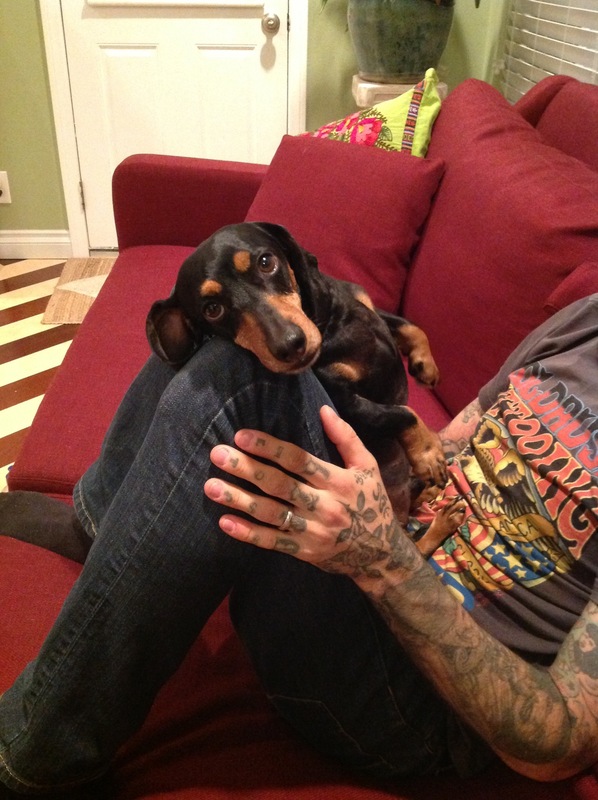 TH- I have had chef clients, but I can’t recall what I tattooed them it was so long ago. I tattooed a cupcake on a baker friend a while back, that was fun. TH- When I lived in Miami my roommate Mattie and I would meet up with our homie Mark every weekend at Nobu. This is when all of us were making decent money and living carefree. Every weekend, before we went out, we would talk story and laugh our asses off while eating the best food around. Those were some of the happiest times of my life with some of the most favorite people in my life, I will never forget it. BP- What is your favorite style of food and why? TH- I don’t know if I have a favorite style of food. Is there a name for modern fusion food? I’m really in to that type of food right now. Anything out of the ordinary and inventive, I’ll try it all. BP- What is your input on the correlation between the tattoo and culinary industries? TH- I think that in cooking, just like tattooing, any minuscule change in style or preparation can change everything. Also, now that there are TV shows on cooking and tattooing every knucklehead wants to be a chef or tattooer. Because “it looks so easy”… Just like on TV… Pfffffft! BP- In your travels, what is the craziest food experience you’ve had? TH- While in Indonesia, somewhere between eating magic mushrooms, surfing, partying and barreling down every side street on my motorcycle, I went to a very obscure place of food. 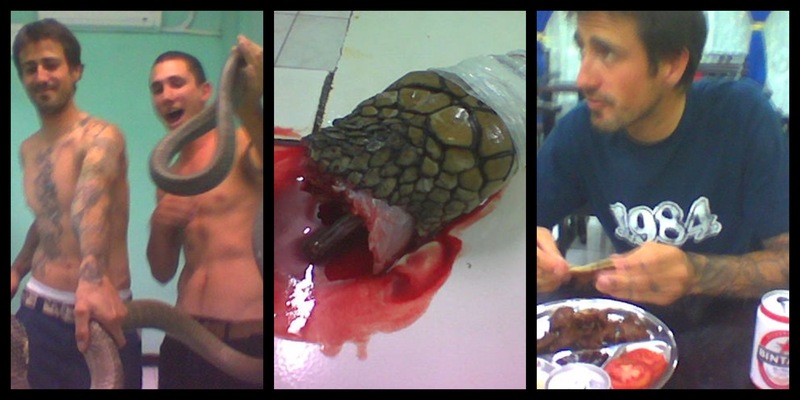 We went to a medicinal snake house where we drank cobra blood and then ate cobra soup. My friend, who lived there, talked the guy into letting us play with the king cobra beforehand, that was a pretty epic and frightening experience. Now I know people get all sour on killing a cobra for it’s blood but let me reassure you that every part if the cobra is used, even the entrails and bones. It was a tasty and exhilarating experience. BP- Do you have a favorite restaurant? World, home and New York? TH- Even though I’ve had great food all over the world, right now I’m fond of Sons of Essex in NYC. TH- I used to line cook for a living when was young(part time), so I hate cooking for myself anymore. Fortunately my wife Liz is an incredible cook and loves to cook. 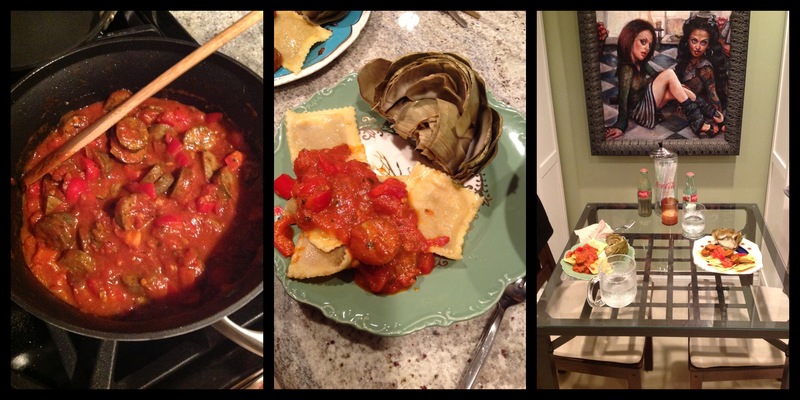 I am SO blessed and love everything she makes, but the mushroom bourguignon pasta she recently made was off the HOOK! TH- I would like to be surprised with a meal, I love being surprised with my entrée. For dessert I would like 3 pistachio macaroons, slightly chilled. For my drink I would break my sobriety with a class of red wine spiked with 3 OxyContin, I mean why not, I’m about to be executed for crying out loud! Thank you, Tim, Liz and Buddy, for welcoming me into your home and fixing me dinner, it was delicious!